How many great nurseries have you been to that are in the middle of a shopping mall? Not very many, right? To be fair it’s not a traditional mall, but rather the open-air type that marketing people refer to as a “lifestyle center” (puke). 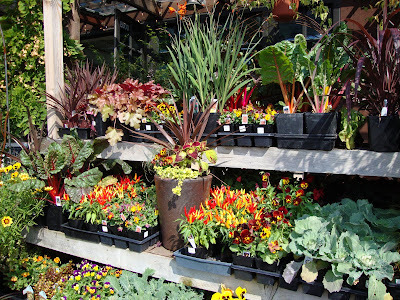 The location, in Seattle’s University Village, is one of my favorite things about this nursery. 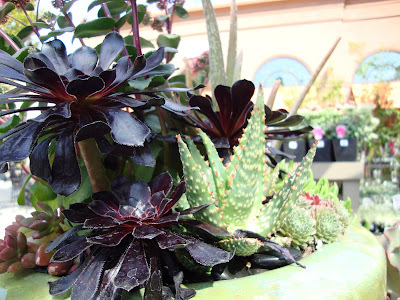 Ravenna Gardens isn’t the cheapest garden center, nor does it have the widest selection but it does have a well edited group of plants, pots, books, tools and the like. Plus it softens and greens up what is otherwise a mall parking lot. It’s a locally owned and more “connected” version of the deceased Smith and Hawken. All the displays at Ravenna Gardens are so colorful and well put together, and they are always in-touch with the seasons (unlike me), just look at all that great fall color! 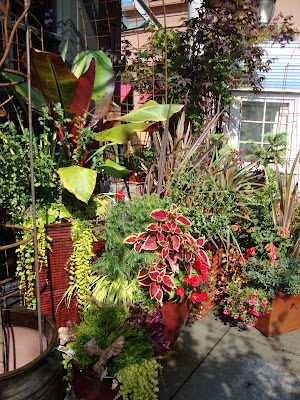 I love this container planting, which is surprising if you’ve noticed my usual 1 plant per planter style. I hate (make that absolutely HATE) the whole “thriller, filler and spiller” recipe for container plantings. That might be necessary if you’ve got a bunch of pansies, but not if you stick with bold, spiky and dangerous plants! 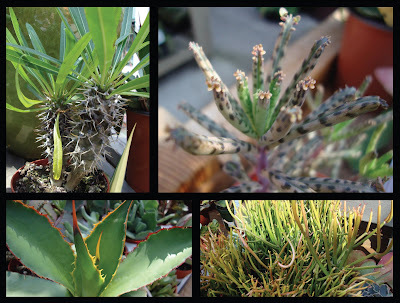 Most impressive to me was their fabulous selection of succulents, agaves and aloe. I wanted them all! But managed to not buy a single one. Now that’s impressive eh? 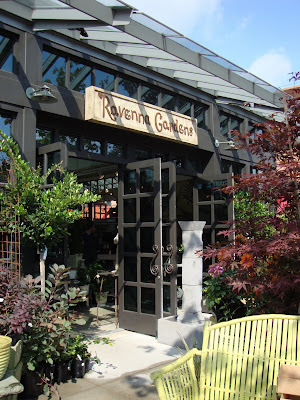 I was sorry when Ravenna Gardens closed their short-lived shop in Pioneer Place some years ago. I think they were one of the original tenants. 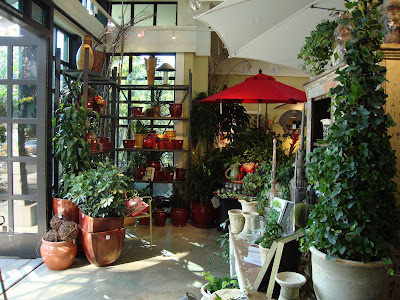 It was great to pop in for a pot, plant or just a look-see at lunch time, something I certainly can't do in downtown Portland any longer. p.s. I also experienced a celeb spotting in the mall that day.... can anyone guess who? I assumed he lived nearby, but now I realize he might have been filming in the area. I associate him with the Pacific Northwest. Well you've definilty affected me. Today while driving to lunch I saw several "danger garden plants" lol. I was like hey.. I think that's an Agave..
That does look like a great place to while away an hour or so. 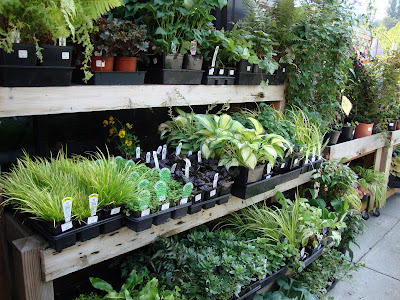 As for container plantings, I'm curious to know if you stick with one plant even in a large-ish stock tank planter? I'm about to plant a 3-foot diameter stock tank with a mix of cacti and succulents, along the lines of these at Big Red Sun. I think they work beautifully together, but I agree that single specimens are great too. Oh, I got nostalgic at seeing the Ravenna Gardens pix - I worked at Pioneer Pl. and Lake Oswego stores. It was so sad when they left PDX for good. Too many lookie-loos and not enough shoppers. It was always the beautiful store for ideas and eye candy but unfortunately that doesn't keep the stores open. Please shop to support the small local retailers to keep them alive! Jane, wow I had no idea! Must have been before I was a Portlander. Interesting as I had no idea that they were once targeting other cities for expansion. BATGT, uhm...well when I lived in Seattle the TV show Northern Exposure was going strong so we regularly spotted cast members around town??? MTJulie, Yea! So are you adding any danger garden plants to your landscape? My Garden Coach, wow...I had no idea! Lake Oswego too? They were really expanding. I have bought several things there over the years, and on this last visit my friend Erin bought something. Plus we carried it all through the mall and got lots of questions so maybe a few others high-tailed it over there and bought! Grace, hello! There are usually 1 or 2 must haves that can cause me to break open the pocket book. And not everything is pricey...so if you find yourself in Seattle and in the U-District you should check it out! wonderful collection they have got. The look and feel is awesome. I must say they have got some beautiful container plants collection. thanks for this virtual visit. My favorite nursery here just closed. It was THE place to go for the unusual plants - Funkie Gardens. 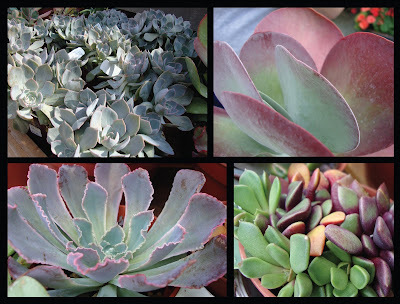 I love all the succulents that Ravenna Gardens is offering - too bad it's halfway across the country. Lucky! I thought the name sounded familiar, I must have been to the Portland store back when it was around. I'll be headed up to Seattle for an annual family trek for holidays with the in laws, I'll have to stop and check them out while I'm up there. I'm so glad I'm in good company hating the thriller filler spiller rule.